Parikrama (meaning "the path surrounding something" in Sanskrit), also known Pradakshina ("to the right") representing circumambulation. Commonly, both words are mostly used as verbs (as elaborated in following sections), in context to religious deities in a temple, sacred rivers, sacred hills and a close cluster of temples, and "doing" a parikrama as a symbol of prayer, is an integral part of Hindu worship. Circumbulatory or pathway around the shrine of the temples by keeping time is a common form of prayer in India. This pathway made of stone around the shrine is called Pradakshina path. Parikrama is done around sacred fire (Agni – the fire God), Tulsi plant (Ocimum tenuiflorum) and Peepal tree. Parikrama of Agni or Agni Pradakshina is a part of the Hindu marriage ceremony. 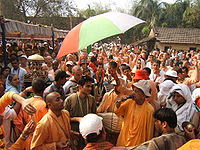 Parikrama of the Narmada River, Govardhan hill, Vrindavan, Vraj Mandala, Panchkosi, Lili and other practices are performed. - The pathway made of granite stone around the shrine is called the Pradakshina path. - Pradakshina around the sacred fire is a part of the Hindu marriage ceremony. Parikrama is also practiced in Buddhism. A legend related to Lord Shiva and his two sons illustrates the importance of Pradakshina or Parikrama. It is said that Lord Shiva asked his two sons to circumambulate the universe to gain worldly knowledge. While his first son Shanmuga spent decades to go round the world on his peacock, his younger son Ganesha walked a full circle around his father and justified his action by stating that the World was contained within Lord Shiva, his father. This legend justifies the importance that Hindus attach to the practice of Parikrama. The importance of the Narmada River as sacred is testified by the fact that the pilgrims perform a holy pilgrimage of a Parikrama or Circumambulation of the river. The Narmada Parikrama, as it is called, is considered to be a meritorious act that a pilgrim can undertake. Govardhan hill which has great religious significance in view of its association with Lord Krishna, presently at its highest point is just 25-metre (82 ft) high and is a wide hill near Mathura Vrindavan in Uttar Pradesh, India. It is a narrow sandstone hill known as Giriraj which is about 8 kilometres (5 mi) in length. ... Govardana Parikrama [circumambulation — going 21 kilometres (13 mi) around the hill] is a sacred ritual performed by many believers as spiritual purification. Vrindavan Parikrama is a spiritual walk undertaken by devotees around Vrindavan town in Uttar Pradesh. It has no particular start or end place. Since 1986, the Vraja Mandala Parikrama held during October–November is in vogue. It follows the same route taken by Sri Chaitanya Mahaprabhu during his visit to Vrindavan. In the temple city of Ayodhya in Uttar Pradesh, India, Panchkosi Parikrama is performed over a two day period. Lili Parikrama is a seven-day festival held at Mount Girnar in Junagadh district of Gujarat, India. The pilgrimage involves a climb of 4,000 steps to reach the top to the sacred Mount Girnar venerated by both Hindus and Jains. In case of Maha Dev or Lord Shiva, there is a deviation in the Pradakhsina/Parikrama practice. The Pradaksina though taken clockwise is never completed round in this case. 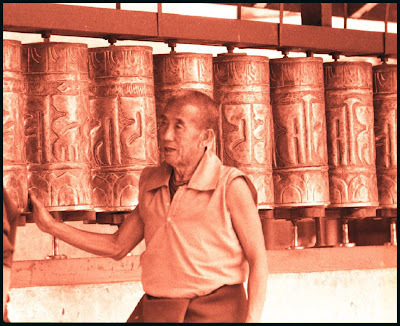 In the Buddhist religious structure, since early days, Circumambulation or Pradakhshina has been an important ritual. Sacred structure, stupa or images have essentially a pradakhshina path around it. Shayana Pradakshinam is done in a lying posture. The arduous journey across the Tibetan plateau had taken its toll on most of us. While the fabulous vistas and the serene landscape of Manasarovar instantly lifted our spirits, our bodies looked forward to a few days of rest. The toughest part of the tirth yatra (pilgrimage) still lay ahead of us: performing a parikrama of Kailash! In a temple, Hindus generally perform a pradakshina of the deity by walking around it in a clockwise manner. 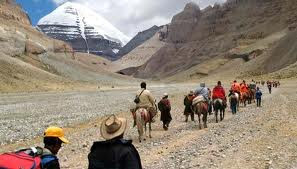 Mount Kailash is the icy abode of Shiva and Parvati and thus in reverence, we were to perform a parikrama; same as a pradakshina, but walking around the entire mountain! This would take us three days and we had to trek rough terrain, cross streams, climb steep trails, jump from boulder to boulder and traverse a pass high in the mountains at 19,200 ft on the second day – rain, snow or shine! And we would be camping on the mountain side! Coincidentally, the hike over three days was slightly over 42 kms, the same distance as a marathon! I would do another marathon in a jiffy. 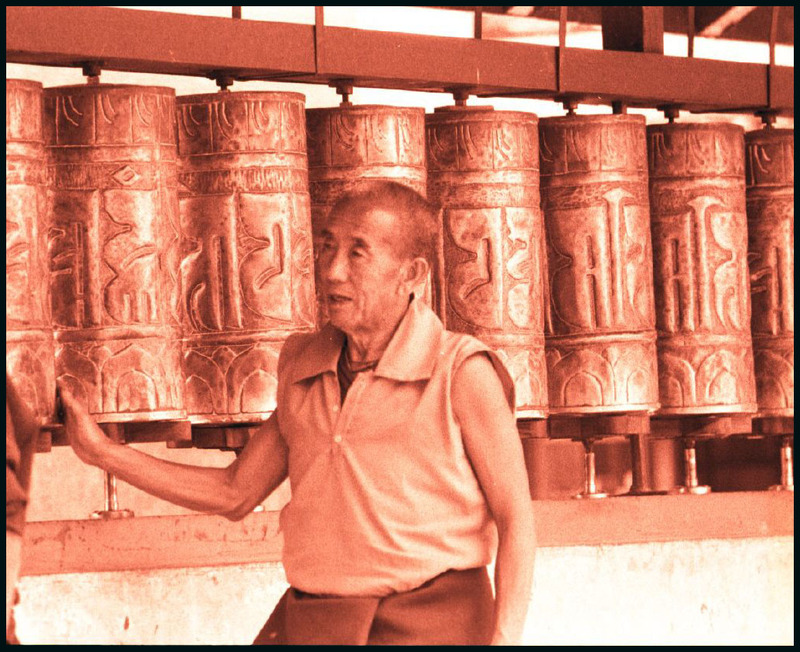 Circumambulation of a Tibetan temple, while turning the prayer wheels for extra merit.
. The Walking Mandala .